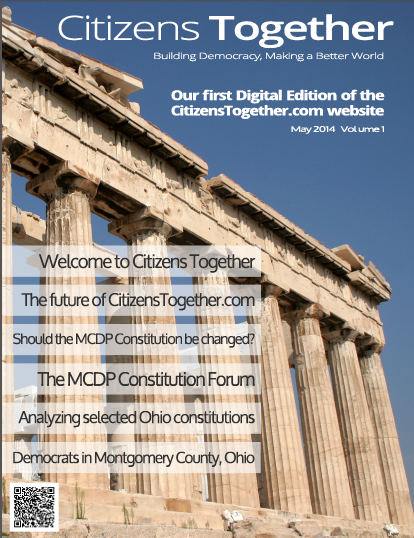 Background information — a PDF for each of the constitutions of the Democratic Party in Ohio’s 25 most populous counties, and articles about the MCDP previously posted on DaytonOS. Comments are allowed on each of these. A Survey — open to all registered visitors — with the opportunity to make open ended responses. The results will be posted. Participants in this survey can live anywhere in the world and can have any political POV. A Forum —open only to an identified group. The idea is that by restricting participation to the group most central to the discussion, the conversations will be more in-depth. Since this first edition concerns the MCDP constitution, this first Forum invites all registered Democrats in Montgomery and Greene Counties to participate. The State Budget, the history of Ohio taxation and the future of taxation in Ohio. Elizabeth Warren’s new book, A Fighting Chance. Our democracy is failing, in part, because we lack effective communities of individuals who respect each other, who work to understand each others’ points of view, and who practice democracy within their own groups. The goal of Citizens Together is to help build grassroots democracy by empowering individuals to gain in-depth understanding of civic issue and by helping groups to become authentic, democratic communities. Wouldn’t that be great? Contact me, Mike Bock: Click here to send me an email.